Horseradish plants are part the Brassica family, which also includes mustard, turnips, and cabbages. The plant is native to southeastern Europe and Asia and is now cultivated all over the world. While the horseradish root has no distinctive aroma, once it is cut or grated, it releases enzymes that creates a pungent taste. In a small amount, it can add a strong, spicy, wasabi-like flavor to food, but it can also heavily irritating the eyes and sinuses. The term “prepared horseradish”refers to the product created when the grated root is mixed with vinegar. It is used for diverse array of culinary purposes, adding kick to sauces, condiments, and even drinks (like a Sunday morning Bloody Mary). Horseradish leaves, which have a similar taste to mustard greens, are also edible, but are less popular or common than the root. If buying fresh horseradish root, be forewarned that it is highly perishable. Once grated, horseradish must be used immediately or covered in vinegar. 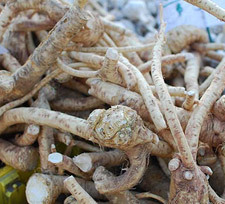 Otherwise the root darkens, loses its pungency, and becomes bitter. If refrigerated, horseradish will keep for about four to six weeks.